A chemical looping reactor is depicted at the center, with details shown in the four surrounding boxes. The use of carbon capture and storage (CCS) technologies would reduce over 90 percent of carbon dioxide emissions from fossil fuel power plants, which play a critical role in powering the nation’s electricity generation. Many novel technologies, such as chemical looping reactors, are currently being pursued for a new generation of clean fossil fuel power plants capable of generating competitively priced electric power. However, many of these technologies have only been demonstrated in the laboratory and need to be built to pilot- then industrial-scales. Researchers are relying on highly detailed computer models and simulations to optimize these large-scale designs because building and testing prototypes would be prohibitively expensive and time-consuming. On exascale computers, researchers will develop and refine models that can simulate particle and fluid dynamics in a 50-kilowatt laboratory reactor, including all the chemical and physical phenomena contributing to carbon capture. This small-scale model can be used for comparing simulation results to laboratory results to ensure accuracy. Researchers then plan to expand this capability for small pilot-scale reactors of up to 5 megawatts. With advanced models tested on the nation’s most powerful computers, researchers can directly impact the design of CCS technologies and help accelerate their development. 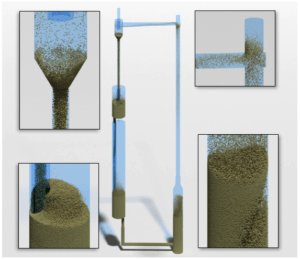 11/05/16 Watch how coal and ash particles flow and react with air and steam flowing upwards in this gasifier simulation.